SIMPLICITY – An incident from Bhagavan Ramana Maharshi’s Life. 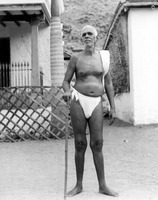 Once a devotee brought a nice walking stick with a silver handle, and presented it to Bhagavan. “Good. It is very nice. Please use it carefully”. “But it is not for my use,” he said. “What an idea!” exclaimed Bhagavan. Look, I have my own walking stick. That is enough,” concluded Bhagavan. “When that one is worn out, you could use this one, couldn’t you?” asked another devotee. “Why these costly things for me? If a bit of wood were chiselled, a walking stick could be made out of it in an instant. While I was on the hill, I used to chisel a lot of wood into walking sticks, smooth them and preserve them. Not even a paisa was spent on that account. Several people took away those walking sticks. They were our own. Why all this ostentation for us? Those cheap walking sticks will do for us”. So saying, Bhagavan gave the sticks back to the devotee. As a rule, Bhagavan does not use costly things. He likes things which do not cost even a paisa.